Travis Heights is a quaint neighborhood in south central Austin full of both charming historic homes and funky new ones. It was first established in the 1890s, though development didn’t really get started until the 1920s. It is an unconventional neighborhood in an urban and hip part of town, and its proximity to the fun South Congress area and downtown Austin make it a very desirable place to live. Travis Heights is located in a booming part of south central Austin. It spans from I-35 on the east to Congress Avenue on the west. The northern border is Lady Bird Lake (or Riverside Drive) and the southern border is Oltorf Street. 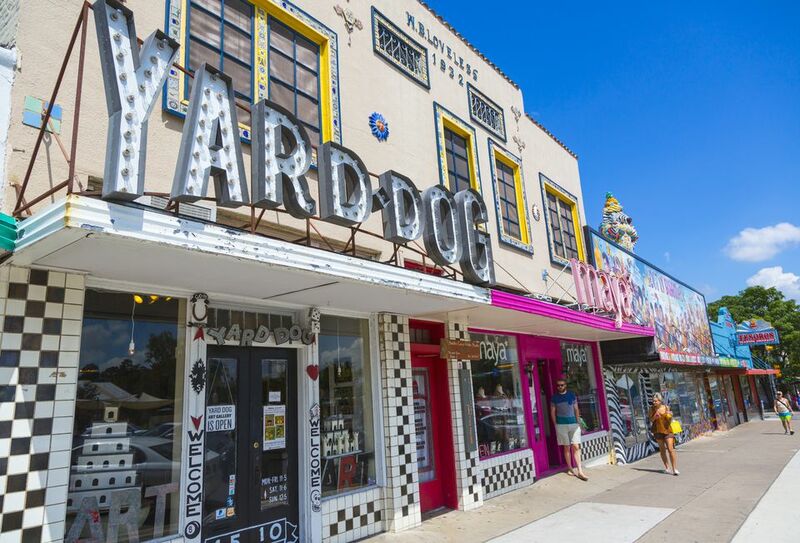 Some Travis Heights residents are fortunate enough to live within walking distance of the area's hip stores and restaurants. Some residents use a bike to get around the neighborhood. However, nearly all residents rely on cars to get around the rest of the city. There are Capital Metro bus stops throughout the neighborhood for those who do not have cars. This isn’t boring suburbia. Travis Heights is known to be a liberal, eclectic area with a diverse population. People in this neighborhood tend to be the type who support the “Keep Austin Weird” attitude, and it’s not uncommon to see liberal political signs in yards or windows. There are plenty of families, but there are also young professionals, artists, and musicians. There are two city parks in Travis Heights, Big Stacy and Little Stacy, which are connected by the Blunn Creek Greenbelt. Little Stacy Park features a free wading pool, a playground, tennis courts, a volleyball court, a basketball court, a playing field, picnic tables and several barbecue pits. Big Stacy Park is actually smaller than Little Stacy and has a free swimming pool that has lanes and a deep end. There is also a hike and bike trail. Travis Heights’ western border is South Congress Avenue, which is packed with fantastic restaurants, such as Vespaio, South Congress Café, Magnolia Café and Gueros. It also features coffee shops, such as Jo’s, and food trucks and trailers, where you can buy everything from popcorn to pizza to tacos. Travis Heights is also just south of downtown, where you can find dozens upon dozens of restaurants and coffee shops. Because Travis Heights is such a historic neighborhood, the homes are all unique and come in all shapes and sizes. You can find everything from modern apartments to mansions to small houses, though the norm is two-bedroom, one-bathroom bungalows. While many of the homes are quite old, the location is in high demand, so home prices can be high. Depending on the size, expect to pay anywhere from $550,000 to $2 million, though the average is around $500,000. Once home to mostly small bungalows on large lots, Travis Heights is now a mix of blockish McMansions and duplexes with only a smattering of surviving historic homes. The neighborhood’s leaders were some of the fiercest warriors in the battle against the proposed CodeNext development code. The mayor and city council decided to abandon the proposal in August 2018, but they have yet to figure out how to come up with a better plan. A walk down Travis Heights’ streets, crowded with construction vehicles, quickly reveals what’s at stake. If the city can’t balance the need for denser, more affordable housing with the need to preserve historic neighborhoods, the very things that led many people to move to Austin in the first place may soon disappear. The neighborhood is also struggling with the increasing popularity of the South Congress Avenue Entertainment District. With hotspots like Guero’s, the Continental Club, Perla’s and C. Boy’s Heart and Soul, Congress Avenue is bustling with activity all day on the weekends and well into the night every day of the week. Despite an abundance of signs, people still park in front of residents’ houses, and the towing companies simply can’t keep up with all the potential business. As the number of bars has increased, so has the number of complaints about public intoxication in the neighborhood. Planning a Lake Travis Wedding? Check Here First.